Botanical Description- The tree grows to 10-15 mtrs. In height, smoky skin of the trunk bears vertical slits. Gum is red in colour. Leaves and foliage bear wavy margin. Flowers- yellowish. Legumes- contain two seeds. Water turns yellow at the beginning and then trunk is dipped in it. Vijaysar is safe and cheap method to take care of Diabetics, weight control and reduce joints pain.Vijaysar was first introduced by Sushruta(1000s of years ago for this disease. About 50 C. C. Water extract should be given in divided doses for three times a day. It provides a sense of well being and keeps normal health along with prompt symptomatic relief. 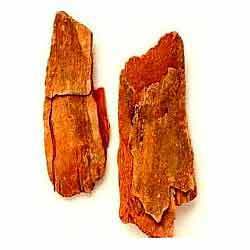 Latin Ayurvedacharyas improved upon this method and prepared a glass of Vijaysar wood in which water was stored overnight and given to the patient in the morning. Vijaysar anti- Diabetes herbal wood Glass is thus, a time tested and effective means of controlling diabetes. It is also a means of reducing excess fat from the body, controlling blood sugar and purifying blood.